Take a good, hard look for Tab in the Google Play Store, and instead you’ll come across myriad ways to play “Stairway to Heaven” on a guitar. But once you’ve overcome the SEO calamity of this mobile restaurant payment app from the Toronto development team previously behind Huddlers and Chime, you’ll find a great new way to split, share and pay for meals in some of the city’s best restaurants. Launching on Android this week, co-founder Adam Epstein told me that the number of restaurants supported by the check in-based solution has doubled in the three months since the iPhone release, from 12 to 24, with more coming soon. The company has transacted close to $100,000 in bills, denoting a slow but steady climb from obscurity. To use Tab, a customer visits a supported restaurant and checks in to the app. Doing so creates an entry on an iPad used by the establishment to later charge his or her party, reconciling with the point-of-sale for auditing purposes. The beauty of Tab is that, like Hailo or Uber, a customer’s credit card is already securely stored by Tab; there is no bill signing process at the end of the meal. One can just stand up and leave. “Servers and restaurants love the product,” said Epstein, claiming that it delights customers to be able to walk away without worrying about figuring out gratuity or spending precious minutes splitting the cheque. Because several diners can join an existing tab, there is no breaking bills or fumbling for change. The Android app comes at an opportune time for the company. 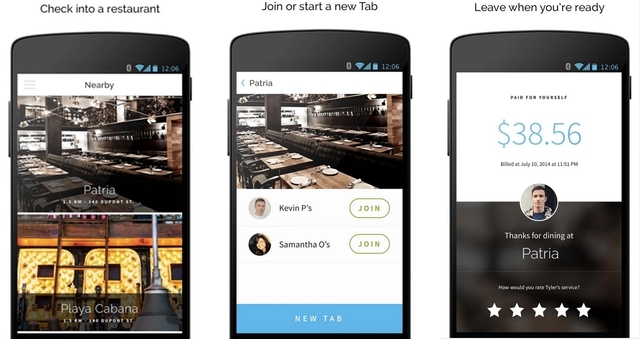 An increasing number of users are becoming familiar with PayPal’s restaurant payment solution, and Tab is using that momentum to educate customers of its benefits. Because a great deal of education is poured into training the servers and ensuring the management is comfortable with the extra steps to process a Tab payment, the startup is gaining a loyal base of return users who, in turn, preach its benefits. “With the Android app, we have double the customer reach as before,” allowing practically all smartphone users to take advantage of the service. The app was developed in-house, and feels fast and native to Google’s platform. The app is on par with the iPhone version in terms of features, but lacks the ability to add multiple credit cards — at least for now. And while Android is the main focus of today’s message, Epstein says the team is not slowing development of its main platform. Soon, Tab will launch iBeacon-based push notifications, educating customers on the benefits of using the service. Because beacons use proximity to determine viability, customers will potentially get messages tailored to them depending on their location within the restaurant. “This is the first iBeacon-enabled push notifications that many Canadians will see,” Epstein told me, proud of the company’s early adoption of the technology. Tab is currently raising a seed round to make the app more personal, and is working to bring the service to more restaurants around Toronto, including a few in Yorkville, Queen West and Ossington.